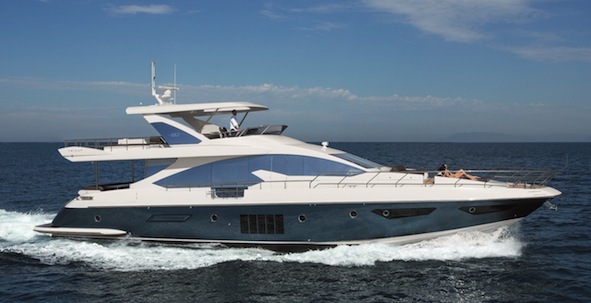 Cannes Boat Show is the venue of the worldwide premiere for the new 24-metre Azimut Yachts. It interprets contemporary lifestyle by offering exceptional comfort: four cabins, five bathrooms and a 42-square-metre flybridge. The innovative solutions introduced for the furnishings and the precise lighting design do the rest. The new Azimut 80 is the first yacht over than 72 feet designed entirely at Azimut’s headquarters in Avigliana, Italy. Developed on the experience of the recent, larger vessels, the Azimut 80 has developed in the exterior design by Stefano Righini while Achille Salvagni Architetti handled the design of interiors. The layout comprises 4 cabins, all with bathroom, including the owner’s cabin extending over the full beam. It can accommodate 8 guests and includes an enormous flybridge, designed for maximum versatility of use. The interior design, developed by Achille Salvagni Architetti, can be proposed on four different styles: from the more classic Dolcevita and Firenze, to the more contemporary Portofino and Riviera, the main differences laying in the chromatic solutions and in the furniture arrangement. The choice of the four different location is a clear tribute to a refined lifestyle and a typical Italian taste and inspires nothing but the maximum relax. Different shades of white and cream have been chosen for the interiors’ palette, creating a well-balanced harmony in which wooden details and decors are inserted, the colors ranging from the softer shades of oak wood, to the darker walnut. The sense of space in the owner’s cabin and in the splendid bathroom are certainly among the strong points of the yacht, together with the innovative windows offering extraordinary luminosity and an unmatched panoramic view. The five vertical windows effectively transform the bulkheads into a single window for a ‘dive into the ocean’ effect. The owner’s bathroom, covering the entire beam of the yacht and with a double entrance located aft of the cabin, is almost a spa, with a central crystal shower box offering maximum visibility on either side of the bathroom. The opening portholes present in all the cabins offer a high level of natural ventilation. In the first model available, dove-coloured leather panels with a barely hinted padded decoration that becomes lighter and lighter in the various cabins, adorn the bed heads of each cabin. The interior decoration of the new Azimut 80 is extremely refined and at the same contemporary, thanks to the combination of fine materials and modern touches: marble for the bathrooms, grey bleached oak alternating with dark wood and painted detailing in the skylights and windows all define a sober, sophisticated atmosphere. The starboard cabin has two single beds and the possibility of a third fold-down bed, plenty of stowage and a bathroom with separate shower, while the guests’ cabin on the port side has a double bed. There is no lack of large windows and opening portholes. In the VIP cabin located further forward, there is one panoramic window on either side; the bed is set centrally with the head towards the bow. A carefully planned lighting design based on LED technology makes possible a sophisticated modulation of the light in each interior space. Moreover, the play of mirrors and the height of the interiors – well over two metres high – ensure a truly exceptional sense of space. The crew’s cabins are located aft, with direct access from the deck; at the moment, two beds are planned, but the possibility of adding a third is currently being studied. The cockpit with teak flooring is extremely spacious and dedicated to socialising, with a large sofa aft and dining table seating eight. The design of two sky-ground windows (1.6 m by 2 m of glass) located in the dining area is very impressive, as it offers a fantastic natural light and breathtaking view. The galley, fitted with Miele appliances, is available in two versions: enclosed or open-space. In both cases, there is a double access, towards the interior and towards the exterior, to assure maximum independence between guests and crew. The main deck is also equipped with a function day toilet. The swimming platform is incredibly large – almost 9 square metres – and provides plenty of room for the launch and retrieval of tenders exceeding 4 metres in length or of jet skis. Further forward, the space is divided into a large sun deck that can comfortably accommodate four people, and an area with a ‘C’-shaped sofa just aft of the windscreen, with further storage. The fly is an ideal place from morning to evening; a convenient and well-equipped bar unit has a barbecue, refrigerator and sink, but also houses a retractable 42-inch TV and constitutes the base for an elegant Plexiglas bar counter. 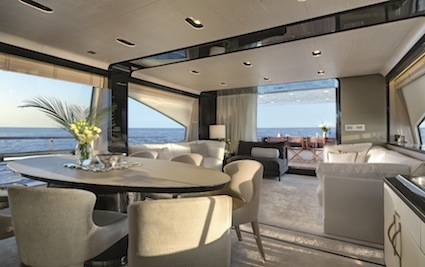 Further aft, the second area offers maximum flexibility in terms of fittings: it can be left unencumbered, furnished with sofas, set aside for the tender or as a sun deck, or fitted with a hydromassage. The Azimut 80 can also be constructed with an opening hard top and rolling awning towards the stern. A sophisticated style is assured for the outdoor soft furnishings, lined in technological materials offering a ‘fabric’ effect. It is a must have for anyone who is looking for a yacht that can be their ultimate playground.